At big shows such as Chicago, brands can get creative in how they engage potential buyers. 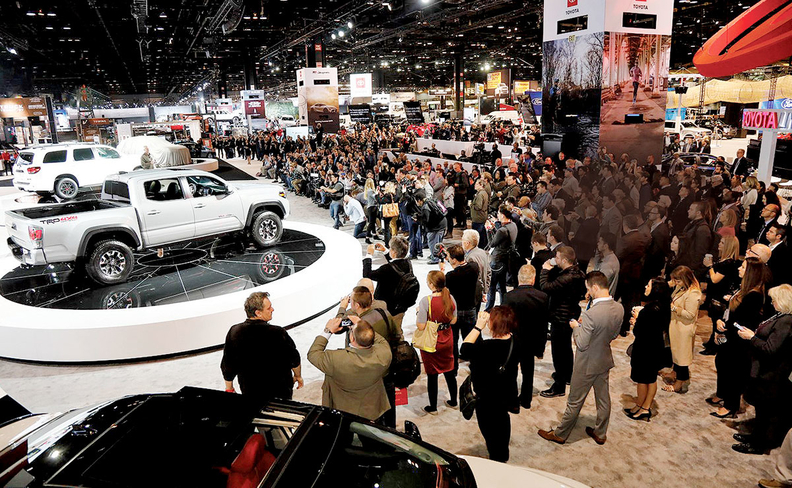 CHICAGO — Two of the world's largest automakers used the Chicago Auto Show last week to offer a defense of auto shows in general. High-ranking executives from Volkswagen Group and Toyota Motor Corp. upheld the value of global auto shows as proven ways to market vehicles. They said larger shows — especially those with venues big enough to house experiential marketing displays such as ride-and-drives — will play an important role in their marketing efforts for the foreseeable future. "For us, it's probably one of the most efficient ways to get in front of as many consumers as we possibly can," said Derrick Hatami, executive vice president for sales and marketing with Volkswagen Group of America. "For us, to be able to get access to 11 million people last year with our products, and have them sit in it, touch and feel, and in some instances actually drive them, it's a huge benefit for us. We always do well when people actually drive the product." Hatami held a roundtable with journalists last week during the media preview for the Chicago Auto Show specifically to defend auto shows as valuable marketing tools. He said that, for a "2 percent market-share brand" such as VW, auto shows provide broad access to already interested shoppers and helps push them to consider the brand. "We have some great brand awareness, but I think we struggle at the model level. I think a lot of people associate Volkswagen with the Beetle and the Microbus, and when you ask them about what cars we sell right now, they have a hard time naming them," with the possible exception of the Jetta, Hatami said. But auto shows can help large brands just as much as small ones, argued Bill Fay, senior vice president for automotive operations at Toyota Motor North America. Though the shows do have their issues, Fay says. "Obviously, it's a big investment for all OEMs, so we have to do it very carefully. We're evaluating the investments in all auto shows, but clearly, the Chicagos and the LAs and the New Yorks that are big consumer shows for us. We're going to continue to be very prominent in what we do and how we approach those," Fay said. "I think we have to be smart in how we tie in our PR and how we bring new vehicles to market throughout the shows, and that's something that we're evaluating now as a company: How do we most effectively do that in the ever-changing world of doing what we do at auto shows?" For many automakers, the investments required to field a display at auto shows can be off-putting, and, like most advertising, the direct return on that expense can be difficult to gauge. Fay said at shows such as Chicago — where space is not an issue in the massive, 2.6 million-square-foot McCormick Place — the elbow room allows a brand to be creative in how it engages with potential customers, and to experiment to see what works best. In previous years, for example, Toyota built an indoor drive experience into its display. This year, that space was taken by FCA's Ram brand. "At many of the shows, we can do engagement activities, so it's a great opportunity to get consumers behind the wheel of our products, so that's very valuable. I think, in a digital world of trackable hits, it becomes a little ambiguous on how to track it, but these major shows are still extremely important for us in getting our products in front of people to start the whole sales process," Fay said. "We try a little bit of everything, then we go back and measure the effectiveness, and how well did we get the support of the media and the rest of the world."